Released in late 2007, the Intel Xeon quad-core 5400 series CPUs (code named Harpertown) are 64-bit server/workstation processors utilizing four Intel Core microarchitecture cores. These processors are based on Intel’s 65 nanometer process technology combining high performance with the power efficiencies of low-power Intel Core microarchitecture cores. 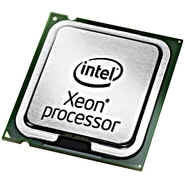 The Intel Xeon 5400 series quad-core processors consist of two die, each containing two processor cores. The Intel Xeon 5400 processor series is available in a range of features to match different computing demands. All processors integrate Intel Virtualization Technology and Intel 64 Architecture and are available in the LGA771 packaging. The Dell PowerEdge M600 blade models will take up to two (2) processors. When adding a second processor to an existing server, the Intel sSpec code must match the first CPU. Unless otherwise noted, processors have been tested and removed from working servers and are backed by our 90-day parts replacement warranty. Heatsinks are sold separately. Click a processor below for more information, availability and pricing.